Myfitnesspal, the addictive but much hated or loved app which many people seem to use. The app that can cause obsession and anxiety amongst some. The app which I have used for months in the past and caused so much anxiety about such a little calorie amount. First off, it is important to know that the calorie goal MFP gives you isn’t always accurate. For example, if I put in my height, weight, activity and my goal of maintenance I get told that I need around 2000kcal a day +/- . But MFP doesn’t know how much exercise I do, doesn’t know that I have CF which means I need more energy and doesn’t know about my metabolism and whether it is fast or slow. So I know that I need around 3000-3500kcal a day and that is what I eat now and maintain my weight on. My fitness pal often gives you a too little amount to eat. I think using portion sizes is alot better for people because then they dont see food as numbers... they can still track that they dont eat too much or too little, but dont have to see food just as numbers or macros, thats why you go to a dietician. I mean dieticians have studied nutrition and how to count calories and macros, set up meal plans and help people with their goals. It is much better to go to someone else, allow them to do the counting and then you get a meal plan, you follow that meal plan and dont have to see food as numbers. Food should be enjoyed, not something stressed about or something that makes you feel guilty. But that is exactly what MFP and similar apps do.... They induce stress and anxiety. You look at your "remaining calories" and think... i cant eat that food because i dont have enough calories. Or you know you are going out to dinner and so you "save your calories", or you are still super hungry after you have eaten all your calories. That is not a life to live. MFP doesnt know you or your body, it gives you a number and often strange ones... i mean who eats exactly 2371 kcal a day? Either round it up or round it down. But also, the body is different everyday and needs a different amount of energy somedays. Somedays you are just super hungry, and its ok to eat more, your body most probably needs it. For example, for girls before or during their period they can feel super hungry... the type of hunger where you want to eat everything. Allow yourself to do that... 1) You wont eat everything... your body has a limit 2) Your body needs the extra food 3) Your body knows how to deal with extra calories. You might not need to stuff yourself with chips, ice cream, cola and chocolate... but maybe you are craving some chocolate or ice cream or both.... go buy some. It is ok to listen to your cravings and it is ok to eat more.... and you definitely dont need MFP making you feel guilty or telling you that "your food is high in sugar" when you are on your period and all you want is chocolate. 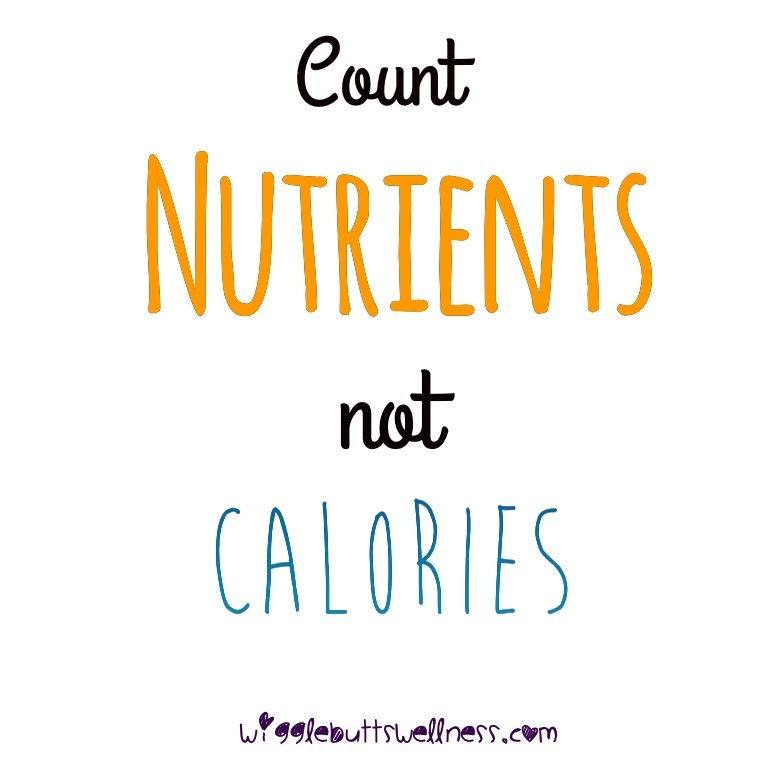 If you know how to count calories, it doesnt just go away... it will still always be there. BUt the first step is to get rid of any apps that you use to count calories. Food is more than numbers, food is delicious and should be enjoyed as well. Get someone else - someone qualified - to help you with a meal plan if you are struggling about how much to eat. You need to enjoy food and eat food you like, not just eat foods with the lowest calories. Because i mean sure, calorie free noodles have barely any calories... but it is also about nutrition and it is much better to eat some bean pasta or whole grain spaghetti than to eat some calorie free noodles. Your body needs all its macronutrients and micornutrients as well as vitamins and minerals daily... not just how little can i eat today? If you use any calorie counting apps, my challenge for you is that this weekend or next week you delete it. Instead food journal if you feel you need some type of control, but dont weigh your food, try to not count your calories and try to go for eye measurements. Breaking free from calorie counting and calorie counting apps is one of the best things you can do. It will give you more time and eventually you feel more free, in the beginning it can be hard and you can feel anxious... but in all honesty, you are just wasting time and energy on calorie counting apps. They cant tell you how much you need each day because that is different and you shouldnt feel guilty for listening to your hunger and eating more. This was really interesting - I had no idea such an app existed! As time goes on do you think you could write more posts along the food line - like what is a balanced diet, food groups, portion sizes etc? I ask because what with my ED and now my meal plan I don`t think I have been eating a balanced diet for years and have no idea about portion sizes or how much of each food group you should be eating. I guess this is more post recovery stuff but it would be useful to know. That would be brilliant Izzy! Thankyou!! After I deleted MFP, I felt like I was really able to break free from my eating disorder. There wasn't this constant guilt over fat/carb/protein portions. I just kept trying to make my daily intake goal lower and lower until eventually I'd eat once a day. Now, I listen to my body and eat what I want, not what some app wants me to eat :) I still have a ways to go until I'm truly mentally recovered, but deleting the app was a crucial first step! Thank you for posting about the dangers of MFP. When I first wanted to loose a couple pounds early last summer I was using it to track calories. However, after a couple weeks of the app telling me "if you eat like this everyday you'll be X lbs in 5 weeks!" I wanted to be that nice skinny girl. Then of course things spiraled out of control from there and even deleting the app months ago I still in my head can calculate how many calories are in everything, how much cereal weighs, etc. It's a nightmare. I would never recommend this app to anyone. So thank you for posting this, it hit the nail on the head with how dangerous such a thing can be even though it has the best intentions.